Naturists and nudists face more and more Puritanism in the modern world. People are become more prude. The mainstream media make people ashamed of their less than paintbrushed and photoshopped body which increases the ‘need’ to cover up. And, take it as you will, religion has its foot in the door as well. Muslims are spreading all over the world, and they are – as far as I know – very inclined to cover the body as well. Why would you cover yourself up if the weather’s fine? As I was thinking about with trials, listening to a podcast about them, and incorporating them in a story, it occurred to me that this spreading out of modern body-Puritanism might well flash back on us, naturists and nudists, if the lawmakers aren’t doing something. But for that to get into lawmakers’ skulls, we have to stand up and proclaim we’re not evil. We don’t work together with some modernday satan, as the former witches were convicted of, to bring down society. There were no witches during those trials. Only innocent victims of mass hysteria. 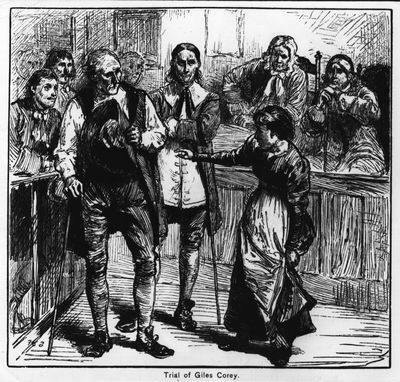 Hysteria caused by fear, stress and uncertainty, because the puritans in Salem Town and Salem Village (currently known as Danvers) had their share of problems. Disputes about who had the right religious system, famine because of bad harvests, feeling forgotten by England, and the many attacks by Natives and the evil, catholic French took their toll, and the ‘witches’ had to suffer from that. They were the scapegoats. Let’s make sure we aren’t becoming scapegoats either. Being naked is natural. I think that’s the main concept we need to get across. Society is losing touch with nature, hand over hand, which is a shame in itself. At the rate nature is being destroyed, our options are getting limited. Let’s stand up. Speak up. Author PaulPosted on January 23, 2019 January 13, 2019 Categories NaktivismTags action, speak up, with trials3 Comments on Naturist Witch Trials?